The school of this pupil had emerged winner in environmental conservation actions under the "Cranes in the Classroom" initiative where three schools competed in the initiative since 2017. The value and contribution of Gilbert's school cannot be underestimated. Over 90% of the population in Uganda are rural based thriving on natural resources based activities especially rain-fed subsistence agriculture. With reduced rain, agriculture stalls; yet with increased rains, often result in floods, soil erosion and mudslides. Uplands and hills of Kabale District have overtime lost fertility and communities have invaded wetlands with hopes of utilizing the eroded fertile soils. However, continued degradation of natural resources is a big threat to food security, cultural wealth and reduced ecosystem services. Environmentally sustainable alternatives to resource degradation must be an important dimension of all areas levels of education. Classroom teaching should embrace important aspects of environment like combating soil erosion and deforestation, energy, water and biodiversity conservation, food security and climate change. The "Cranes in the Classroom" initiative in which Gilbert actively participates, is intended to do exactly this. Here, we prefer working with young children who are just beginning to actively interact with their physical environment, since this is the prime time for developing their creativity skills of story-telling, music, dance and drama, drawing and painting, poetry and modeling which are not only meant to enhance the pupils' understanding of nature but also would cause attitude change in the wider community. The pupils are progressively subjected to assessments to test their appreciation and interest in conserving Uganda’s natural heritage. In August 2018, the patrons of the schools were invited to a community leaders' meeting during which they made presentations and exhibitions on their work progress. Exhibitions included modeled wetlands, crane pictures and paintings, stories on how pupils care for their environment at school, polythene use and reuse, and how their actions at school are replicated at home. Their stories would be concluded with a pledge for each pupil stipulating what they vowed to practically do this year so as to impact positively on mother earth. 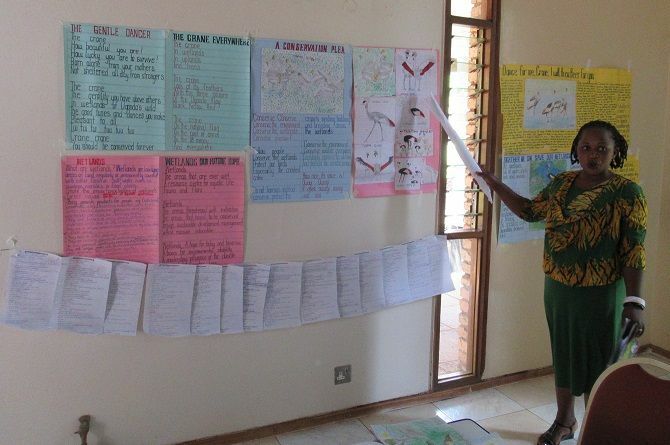 The presentations, exhibitions and stories were adjudicated upon by an expert team comprising of ASP Kajera – an Assistant Superintendent of Police, Prossy, a news anchor at Voice of Kigezi FM and Evas the District Environment Officer, Kabale. Buranga primary school, scored 95% and emerged the winner, Buhara scored 65% and took up the runner-up position while Rushabo scored 48%.